Two sisters, Deanna and Christine loved reading. They both loved books. They both were creative and savvy businesswomen. 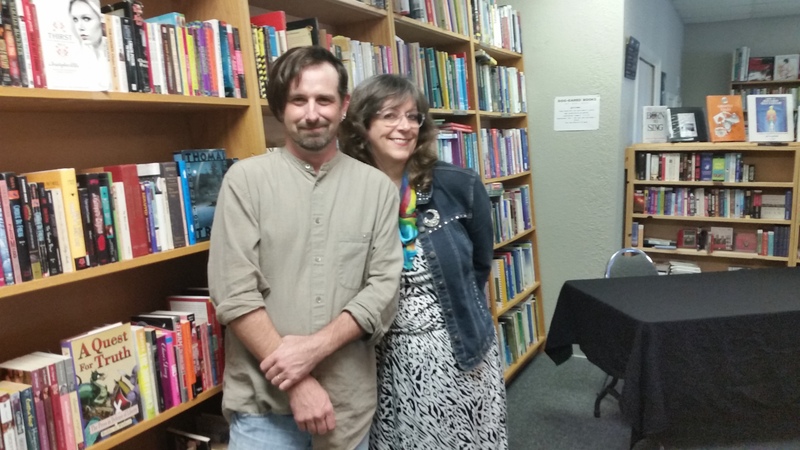 They shared the same dream: own a bookstore. After years of planning and dreaming; wishing and toiling, it happened. 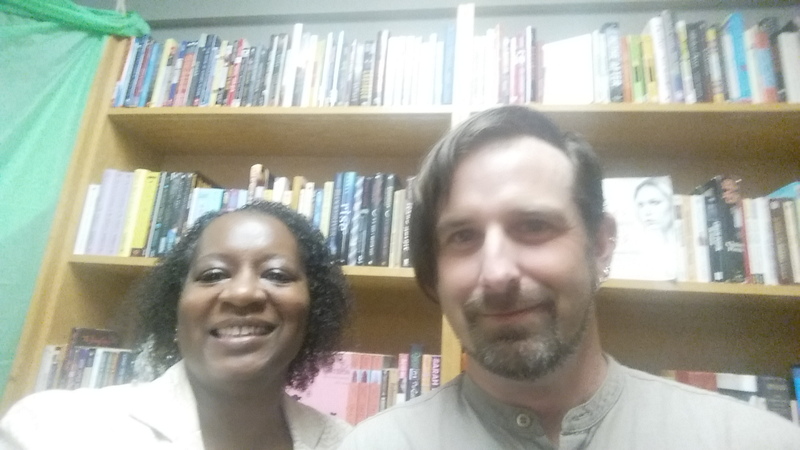 In June 2015, the sisters opened Dog Eared Books in Weatherford, Texas. I was fortunate to visit their store this past weekend and I hope one day you can visit it too because it is fabulous. Very well organized. Seemingly every genre represented on the shelves. Comfortable seating and refreshments. Creative displays. Fair pricing and trade policy. Wide selection of new and used books. Plus, movies and music for all. In just a few short months, the sisters have already anchored Dog Eared as more than a bookstore (not that there’s anything wrong with being simply a bookstore). It is a community center; one that hosts education sessions, children’s activities and book signings. That’s how I met the sisters. 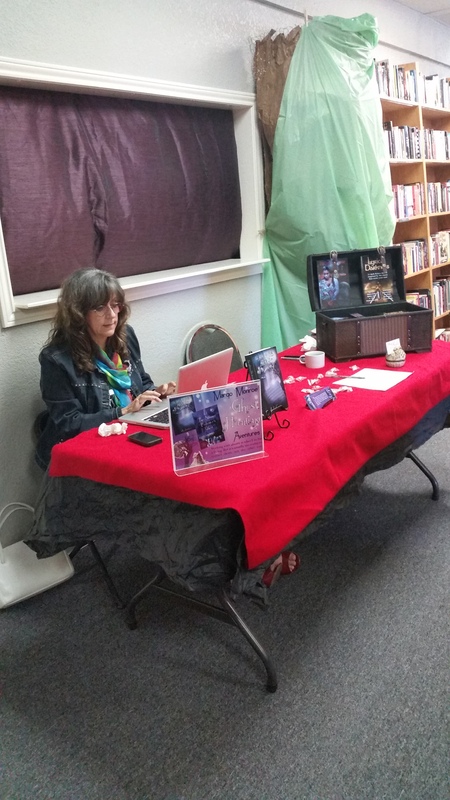 I was invited to participate in the store’s first Paranormal Book Signing to kick off the Halloween season. And what a time we had! …speaking with young readers, meeting fans of the genre, reading the store’s educational display, meeting other like-minded authors, and the conversations… Where else but at a paranormal book signing can there be in-depth discussion on time travel, fairies, banned books, gravity, ghosts, movies, Elvis, pumpkin spice coffee, book cover colors, cake balls and more? 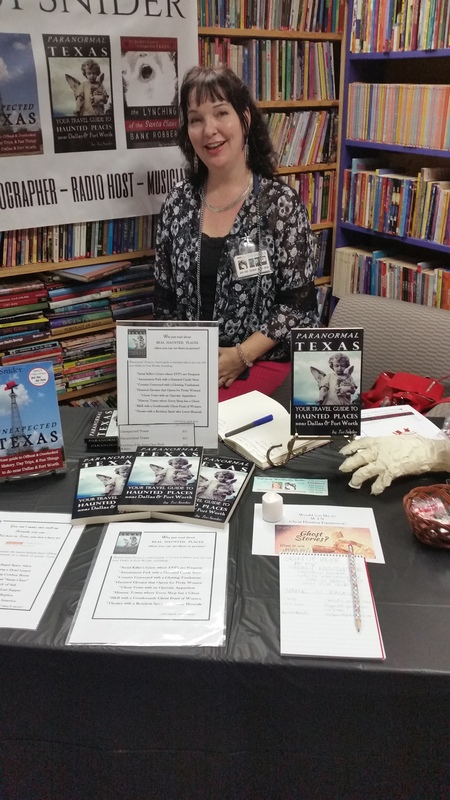 I am already looking forward to October 2016 for the second annual Paranormal Book Signing. I hope I get invited back (after that third cup of pumpkin spiced coffee, I did get a little hyped, meaning, I could not stay in my seat), but even if I’m not on the roster, I’m attending because the hospitality, the staff, the owners, the book selections were just that special. Below are a few of the pics I managed to snap in between sipping coffee, browsing shelves and signing books. Silly me forgot to get a pic of the sisters who birthed this dream oasis on Main Street (Where else? Every town needs a bookstore on Main Street. ), but enjoy just the same. I had planned to save this post for October when National Boss’ Day is recognized but recently I’ve encountered a number of people complaining about their bosses so I decided to share this now. I hope it will offer another way to look at having the worst boss ever. In February 2009, I took a new job as a technical writer. I was so excited because it was with a major employer, the commute was easy, the pay was good, and the company had dress down Fridays (a BIG bonus for me, a girl who loves her sweats). One day as I walked down the hall wearing my new company windbreaker, WBE stopped me and asked why my first initial and last name had been monogrammed on my jacket. I stood there looking like she’d spoken a foreign language. Moments later, I managed to ask, “Excuse me?” WBE repeated herself and again it struck me as ludicrous so I started smiling, looking around for a camera and Ashton Kutcher with his “Punk’d” crew. But no. She was serious! Her rigid stance and angry face told me so. I stumbled through, “This is how I received it.” Spitting words, she asked who ordered the windbreaker. I gave her the name and off she stomped to report the incident to the vice president and off I ran to report the same to the person who had ordered and delivered the windbreaker to me. Thankfully, he was not concerned. He was well aware of WBE’s antics and had a great rapport with the vice president. He informed me WBE’s windbreaker had been monogrammed with her last name only, which was the former practice. I left his office, shaking my head, thinking one extra character—my first initial—had set her off. Needless to say, reporting to WBE was a daily exercise of trying to dodge land mines and every day I failed, managing to step on one and blow myself up! No, I didn’t lose an arm or a leg or my life, but I lost confidence in my skills and abilities. I lost my enthusiasm for the job, for the company, and lost respect for upper management, who seemed to support her in her madness. As the days and months stretched on, fear, animosity and stress piled on. I felt myself changing into a person I didn’t know, and I hated that person. That person was fearful, incompetent, insecure, angry, and she felt cornered. That was the worst! Feeling like I had no way out and no support. Not even when I filed a labor complaint. Then it happened. I went on vacation. During my days of rest and relaxation, I poured into my journal, complaining about my life, my job, my future. I also took time to revisit my life goals, and I recited affirmations as if my life depended on it. Now that I think about it, it did! “Quit,” is the answer that came from that quiet voice within, the voice that leads and directs if one is willing to follow and obey. I asked the same question repeatedly over that lengthy vacation and received the same answer every time. I knew what I had to do. When I returned to work, I gave two week’s notice and promptly took off a week to spend time with family and luxuriate in the feeling of power and freedom. So what did I learn from my experience with WBE? I learned that I was stuck on the wrong life path. But thanks to WBE’s poor management and people skills, it forced me onto the right life path. I am here on Earth to be a self-employed writer and publisher. I was not living that truth until WBE entered my life. I also learned from that experience the real definition of “security.” Security no longer represented a steady paycheck or benefits with a major employer. Security was faith and knowing with surety that God’s word will not fail. Lastly, I learned my encounter with WBE was a karmic setup. After my emotions had returned to normal and I had settled into my new life, I thought about the days when I supervised people. And I had to admit I was not always fair in dealing with those who reported to me. Karma, payback, ‘reaping what you sow’ is real and it can hurt. So you see there was tremendous good from that God-awful experience so I ask you…what is your encounter with your WBE trying to teach or show you about yourself? Take time now to chew on that because the revelation(s) just may save your life. It did mine.